OMG! The complaints are everywhere! I guess the general verdict is that my games are too hard. To be honest, I never thought of them as being "hard". I just kinda skip over the dull early parts, *ARRGGHH!! TUTORIALS!!!! * and get the player right into the game, instead. But folk are complaining. So a new plan of action must be decided. Today, I opened up my Skeleton frame doohickey, and decided to add a Game-And-Watch approach. The engine now has a simple "GameStyle" variable, right up top. B won't have highscores, A will. I'm also tweaking a few other bits and pieces, but for the most part the A/B thing should keep folk happy. Later on today, I'll probably post a BigBaby!-edition of WormBlast. For now, I'm working the skeleton!! I had intended to update this a fair bit. Add music, add extra pickups, things like that. But in the end, I instead decided to leave it as it is. This is (with added Highscore table) pretty much as it is at the end of the two hour session. A nice simple game, with a basic gameplay method. 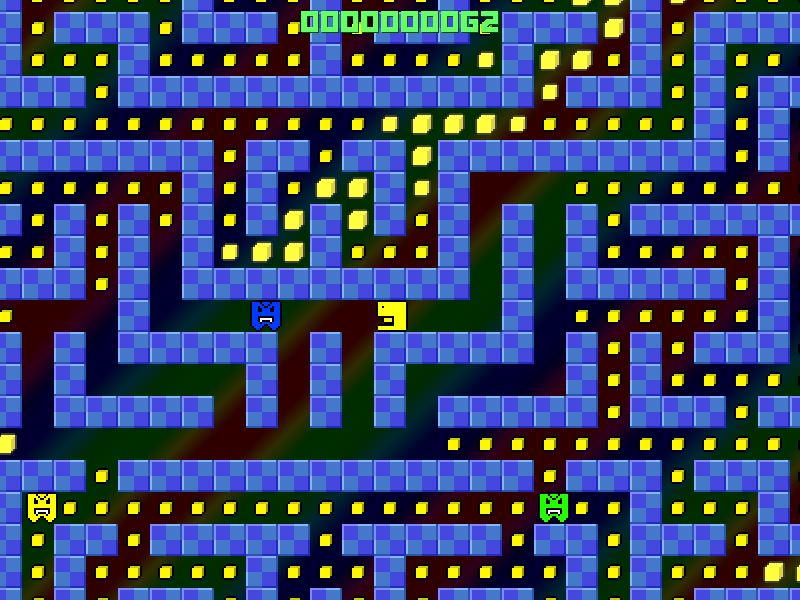 Guide the "worm" through the maze, grab all the blue + blobs, and avoid the barrels. They're very very volatile, so.. best to keep clear of 'em all..
You can Download WormBlast here and then complain about how it's not really a worm..! Yesterday I filmed some stuff, a nice big 250Mb video file, and posted it to Youtube. It took 2 hours to film, and then about 2 more hours to upload, before YouTube spent another couple of hours decoding it, before finally deciding that they weren't going to bother showing it in HD. So, rather than go through all that, and waste another entire day trying to sort it out, I'll just post the annoyingly blurry crap that YouTube have left me with. "Days of Arcade" my arse!!! Uno's a card game, Connect 4's a board game, Battleship's a board game. Who the f'k are you kidding Microsoft? See "Wii Virtual Console : Arcade" for further details. So, whilst I wait for this Wednesday's dull as f'k "Arcade" game to be released, I should probably get some work done on my own AGameAWeek. If anyone has any quickly doable ideas, I'd love to hear 'em! As game time progresses, so do the many bugs that appear! With sprites drawing WAY out of bounds, and memory being messed up all over, there's chaos in the game. But a few tweaks here and there, and everything's coming together nicely! Another slight issue, though, cropped up suddenly. PALib warned me I didn't have enough memory for all the artwork! Uhoh!!! To be fair, it was 2* 512x512 pixel starfields, so it was kinda big. But even so, it wasn't directly loaded into the Video Memory at the time.. It was just a small chunk of art, ready for use whenever. 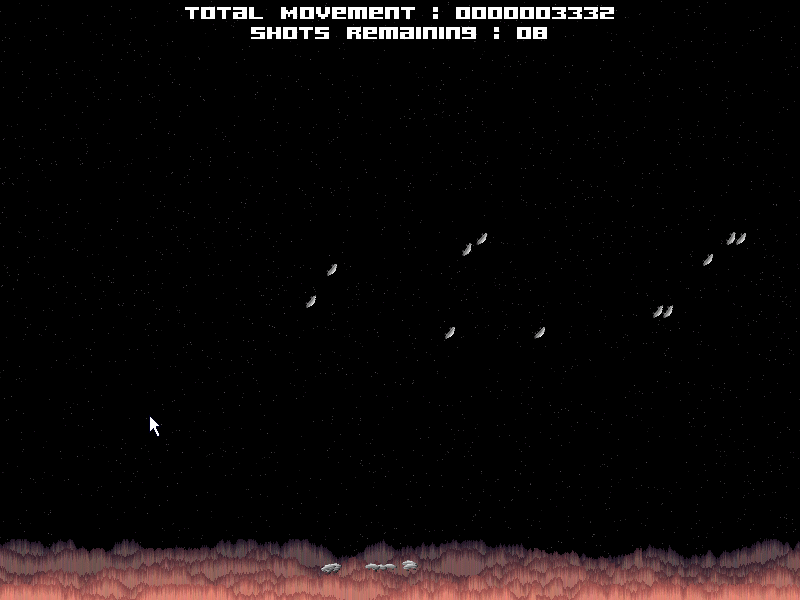 I've reduced the starfield, and that's working now, but it doesn't bode well if I overdo the art in future. I might need to keep an eye on things as I go, because if "Art unloaded" is still taking up that much space in the game, I can't go around crazily drawing mountains of sprites for each and every game. 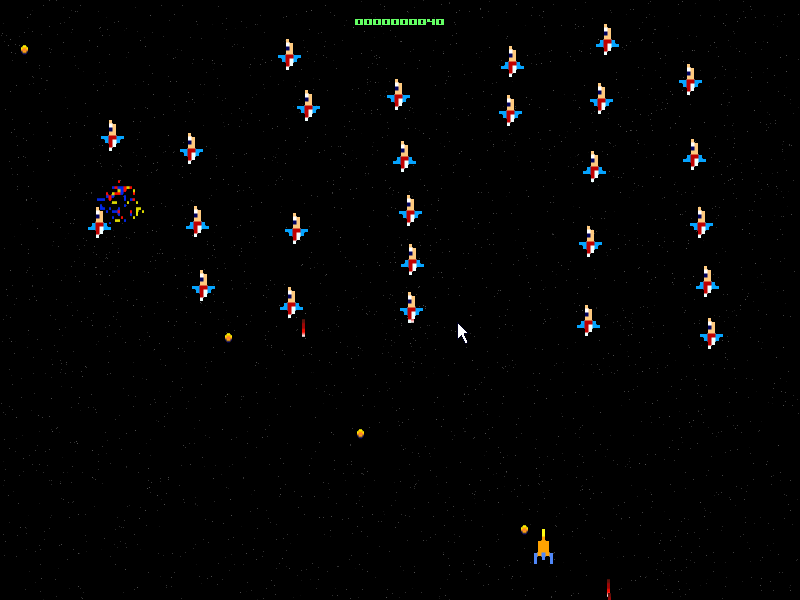 And it has a starfield! PRC2 : Day 12 : Game #4 - Nearly...! Game 3 needed a few tweaks, here and there, this morning. Mostly due to the controls being a little twitchy. And annoyingly, it's becoming increasingly apparent that the missing something is indeed Ingame Music! It's bad enough having to create a jingle for each and every game, but to now start building up a bunch of little ingame tunes, let alone a big enough collection that folk won't grow tired of. That's a lot of music to do! I might need some help with this bit!! Any MOD musicians out there? PRC2 : Day 11 : Finally, Game #3! With more tweaking than my head could stand, I finally got Game #2 wrapped up yesterday, so I'm finally starting on Game #3, today. As stated previously, Game #3 will be reusing quite a lot of the core engine that Game #2 used, so it should be short and sweet putting it all together, like some kind of coded jigsaw puzzle. Once that's done, Game #4's ready to get going (ie, I have a vague idea in my head!) 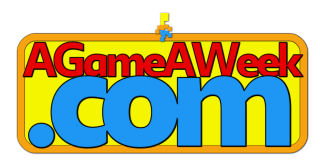 and will also be coded in Blitz for this week's AGameAWeek, so watch out for that.. .. within 2 days! eeek! Carrying on from there, I've got a few quicky ideas in mind that'll do for games #5,6 and 7, although.. Whether #7 will be easy, I'm not too sure.. If not, I'll have to come up with another idea, instead. I still have the large list of ideas, over at GBATemp to refer to. So, shouldn't be too hard! Oh, and the basics of the menu are in. Anyhoo, I'm getting ahead of things.. Game #3 has to be done first! So I'm off to do that. PRC2 : Day 10? : Still Game #2! Off and on, a bit at a time, the past few days, what with the DIY, and the AGameAWeek, and the Socoder work the past few days.. So, rather than call 10 minute sessions a day at a time, I'll call them a great big long "Popping in and out, looking at the code, struggling to figure out what's wrong, and then going to do something else instead" day. It's a cheat, but since the annoying issue is still there, it still counts! I'm stuck on Game #2. And it's annoying that I'm stuck on game #2. Because this small (really small!) bug is actually integral to a lot of other games. Game #3, for one, will need this working. See, as much as I got the wraparound sprites working, occasionally (not very often, but occasionally) one or two of them will inexplicably vanish from sight. It's very annoying, and I'm still wrestling with the code to get them working. I'd like to move on, but still I'm here at Game #2. A nice quicky, this week. Having spent most of the week doing DIY, sorting out Socoder, and occasionally working on PRC2 when I get a chance, I've not had much time for a game, this week.. So, I did what all frantic coders do. No levels.. As you move, pellets will replenish. No power pellets, either, so no eating up the ghosties..
Oh, and it's quite fast, too! So, watch for that! BAH!! DS Coding is annoying!! Another morning complaining to GoDaddy. They didn't know what was up, so I sorted it out myself. Problem solved, eventually, but with no time left for any Game work today..
Game #2's turning out quite well, except it'll probably need to be taken down a peg or two. Currently it's, shall we say, a little psychedelic! And, that's only amplified once it gets onto the blurry DS screen! Lots of motion + lots of colour = lots of Weeeeeeee!!! It looks great, but it's probably not going to look that great for long. The player's in, and I'm ready for adding AI to the game. Once that's done, Game #3 will follow quickly afterwards, since Games 2 and 3 share a large amount of elements. 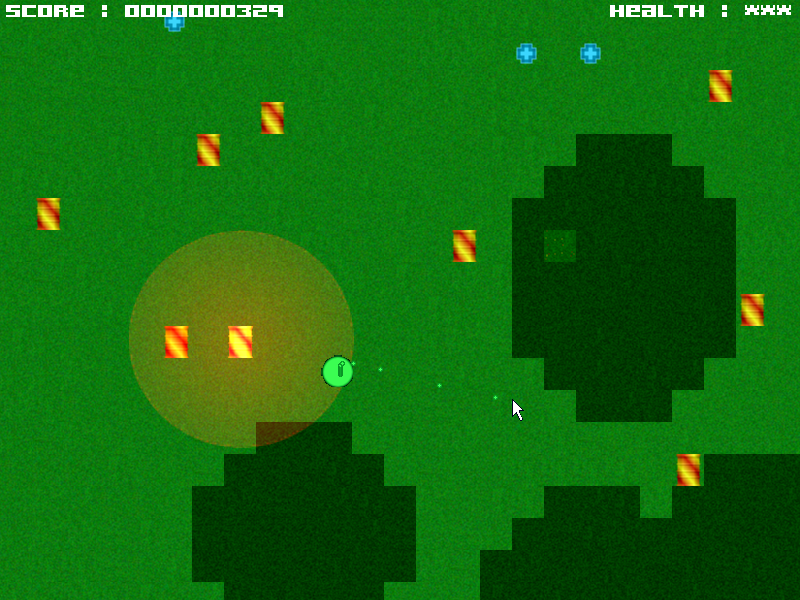 Just a nice simple game this week, mostly done after my shouting at Worms, earlier this week.. It's nothing fancy, as I've been short on time, but.. We'll call it a Start.! Each one counts their distance from their start place. Blast them all to the right, and get a score based on their total movement. You can Download Ship Flinging here. If you want a complete worms clone, you'll just have to wait. Kinda busy right now! And then I thought to myself "Why don't I finish off that new Showcase design for Socoder.. Should only take about 10 minutes". It didn't take 10 minutes. Instead, it took all day! So, no work on my games, today! The new Socoder showcase style is now up and running. Prepare the linkage!!! Game #1, Sokoban, required a nice scrolling tilemap, of infinite size. I spent a couple of days getting that all up and running, so that it'll do for other games, too. But today, Game #2, Surprise!, required a different type of map. Game #2 needs a wraparound map, so you can move from one side to the other, and carry on in a continuous loop. It took me about an hour of tweaking, and a whole lot of %'s to get things up and running, and.. Assuming that what the screen's showing me is the same as what's in it's memory (!) I can now get to work on Game #2. Game #2 should be done by tomorrow, as I know exactly what's going into it, and it's not exactly the world's most complex game! Extreme Ranting : What is wrong with Team 17?! I just paid 400 points for Worms on X360. What the hey, right?! It's Worms... What could possibly go wrong!?! Well, aside from the things I ranted about, on the original DS version, a long while ago..
Well, would you believe it, there's something wrong with the Xbox Live version, too! PRC2 : Day 6 : Nuffin'! Bug fixes already! Oh dear! Sokoban had a bizarre map limit bug, whereby if you were off the left hand side of a small map, it freaked out, and the screen jiggled around like crazy.. In many ways, I haven't done anything to PRC2! PRC2 : Still only 1 game..
PRC2 : Day 5 : Still working on Sokoban! I'm still building up the basic reusable map functions! Had some crazy memory issues, yesterday, but everything seems ok, this morning, so it's time to move from silly map things, to actually building the game up. Starting with a strange grouping of maptiles, I'm going to have to add crates, and a player, and get the movement up and running. It should be pretty easy to do, though, as all the arts ready and waiting. So with all that being done today (hopefully) I should be able to move on to game #2. I'm not really sure what Game #2 will be, just yet, though. I should probably point out, that there's still one issue I'm having, though..
Sokoban's on the bottom screen. Since the game uses a nice neat scrolling screen, it's really difficult to warrant the use of both screens. I'm not sure what I'm going to do about that..
Yeah, I figured I'd forgotten a few things, and as Sokoban gets built up, slowly but surely, all the forgotten things are poking their heads out, waiting to be sorted. Click inside for coder-heavy stuff.. or just grab Sokoban from earlier today and play that for a while! !